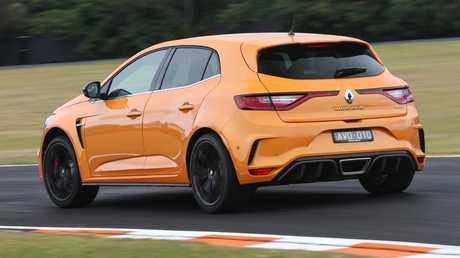 The new Renault Megane RS280 has gone on sale in Australia. Picture: Supplied. There is debate about who invented the hot hatch - a small car with a powerful engine - but both countries have excelled in the genre over the years. 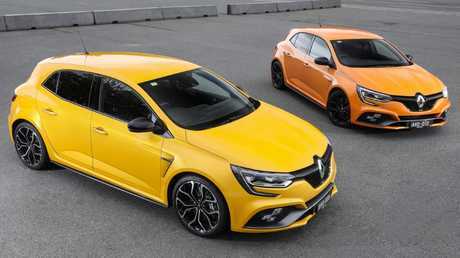 France's riposte is the new generation Renault Megane RS, the badge returning after a two-year hiatus. When France has reacted to criticisms - by softening the next model - it has often ended up with a blancmange. The Renault Megane RS280 blends track performance with daily-driver comfort. Picture: Supplied. Is the new Megane RS the first French hot hatch to break the mould? It's off to a good start with the adoption of a five-door body in place of the previous three-door. 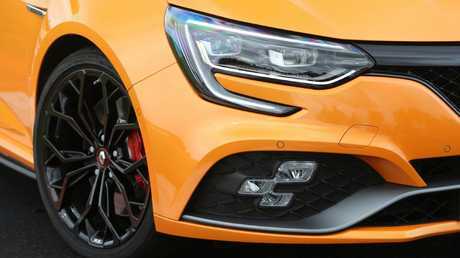 Purists are up in arms but the new Megane RS wouldn't exist if it weren't a five-door, due to the drop in demand for three-doors globally. 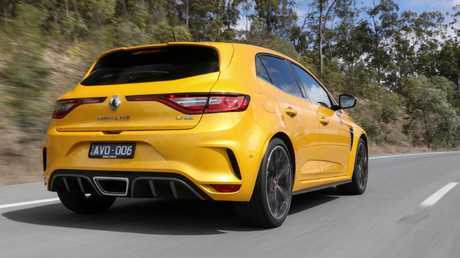 The 2.0-litre turbo - long a staple of the hot-hatch class - has been replaced by a 1.8-litre turbo, which Renault claims is the most powerful of its type in the world. 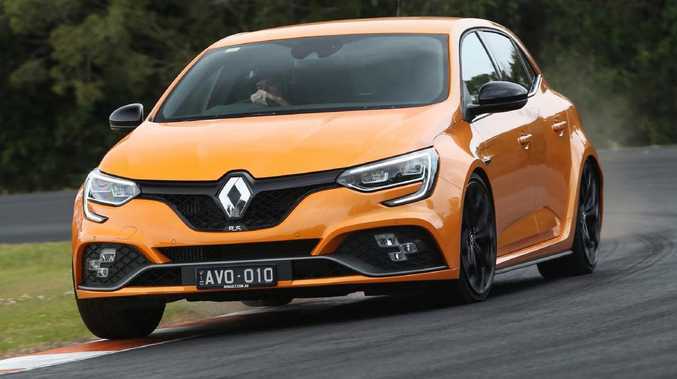 A bigger car than its predecessor, the Megane RS has put on 48kg (to 1427kg) for the manual and added 71kg (1450kg) for the auto - largely negating the power gain. The new model is heavier and has a smaller engine, but performance is still brisk. Picture: Supplied. Hot hatches aren't only about straight-line speed but in the industry-standard 0-100km/h test we stopped the clock at 6.0 seconds in the manual and 6.2 seconds in the auto, which has a different spread of ratios. The official claim is 5.8 seconds. The muffler's snap, crackle and pop are more pronounced in the auto thanks to the build-up in pressure in the split-second between gear changes. The manual is oddly quiet. Sports seats and a large vertical touchscreen dominate the cabin. The manual has a handbrake lever, the auto gets an electric park brake switch. Picture: Supplied. The manual's "Cup" option pack, for $1490, adds a mechanical limited-slip differential - previously standard - bundled with black 19-inch alloys, 10mm lower suspension and two-piece front discs with four-piston Brembo brake calipers painted red. On both versions, the bigger front discs - 355mm - better handle repeated punishment. 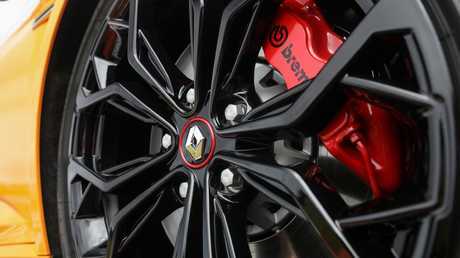 The Renault Megane RS280 Cup gets red brake calipers and two-piece bio-material discs, but they are the same size as the Sport Chassis models. Picture: Supplied. Tyres are 19-inch Bridgestone rubber. There's ample grip but they're noisy on coarse surfaces and can hum on smooth tarmac. Renault says this is the trade-off for grip but other tyres grip with less groan. A highlight of the car is the steering, which is remarkably accurate and gives precise feedback. The effect of the rear-wheel steering is difficult to detect - perhaps because it is doing its job well. The bulging sports seats are snug and surprisingly luxurious. Rear passengers aren't afforded the same comfort - with tight foot and kneeroom - but they get rear air vents. The large vertical dash display can be personalised and there's a large digital speedo to keep your right foot in check. One blot: the rear-view camera view is grainy at night. Front, rear and side sensors help take the guesswork out of parking. 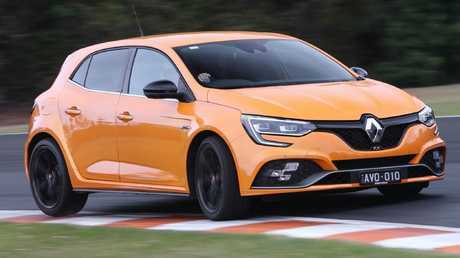 The new Renault Megane RS gets closest yet to Germany's benchmark VW GTI hot hatch, combining two cars in one: daily driver meets weekend track-day warrior. The Renault Megane RS280 Sport Chassis, left, and Cup Chassis, right. Picture: Supplied. TECH A large tablet-style touchscreen and fancy digital instrument display give the cabin a lift. Super-bright LED headlights make it easy to spot corners at night. Front, rear and side sensors and rear-view camera mean you're less likely to scratch the rims. PERFORMANCE Despite the smaller 1.8-litre turbo (previously 2.0) - and a heavier body - Renault says the new Megane is slightly quicker. Claimed 0-100km/h time for the auto is 5.8 seconds, quick for a front-drive car. We clocked 6.2 seconds in the auto and 6.0 in the manual. DRIVING There is rear-wheel steering (up to 2.7 degrees) in certain modes. Trick new suspension is described as "a shock absorber within a shock absorber" to iron out the worst bumps. Auto gets launch control and paddle-shifters. Mechanical limited-slip differential was previously standard, now it's part of a $1490 option pack. DESIGN It's longer, wider and lower than the previous model - and the Megane hatch on which it's based. Purists will lament the loss of the three-door body but the five-door will broaden appeal. Front and rear fenders are wider than the donor hatch, hence the muscular stance and bigger footprint. The performance of the LED low and high beams are impressive. Picture: Supplied.